History and tradition, blue sea and mountains and greenery..reads the guide map. Choice and relevant words for one of Japan's must visit places. From the iconic o-torii gate image to the surrounding mountains. Miyajima is a wonderful place to explore. Easily accessible from Hiroshima and is the perfect place to visit as a day away from the humdrum of the city. It is certainly a place anyone visiting the area should take time out to visit. And from the number of tourists heading there on the day we went, then its very much prominent in peoples travelling agendas. Upon arrival it's fair to say you are in solid tourist territory. Souvenir shops and restaurants line the seafront, along with the roaming wild deer that are all to happy to greet you. A visit to Itsukushima shrine is a must and depending on your fitness levels heading to the summit of Mt.Misen should also feature on your agenda. You can either walk, which takes at least 2hrs or jump on the rope way (notice the humour in the sign that directs you to the station). 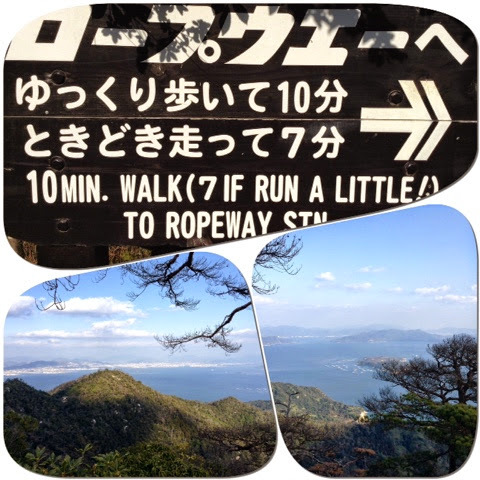 At the top you won't be disappointed with fantastic views across the Inland Sea; Hiroshima on the horizon (see below). Once back down at sea level head to the shopping arcade where you must try some of the local cuisine, especially the (deep fried) Momiji Manju, a bun filled with a variety of fillings; bean paste and walnut for example. Its shaped into a maple leaf and is a 100 yen delight. The queue for these delicious treats testament to their popularity. Other shops vie for your cash, selling cheap gifts to expensive foods. Unlike some places you don't feel pressured to buy and you can happily browse away. There is plenty more to see and do (temples, a museum of folklore and an aquarium). So you shouldn't get bored and why would you when you are at one of Japan's national treasures? 2) Eat Momiji Manju (maple leaf shape buns that come with a variety of fillings, bean paste and walnut amongst others). Top tip - try the deep fried version. They taste amazing. 3) Take the ropeway (or walk) up Mt.Misen for fabulous views across to Hiroshima and beyond. 4) Enjoy Misen Primeval Forest (if not taking the rope way) - there are plenty of walking routes. 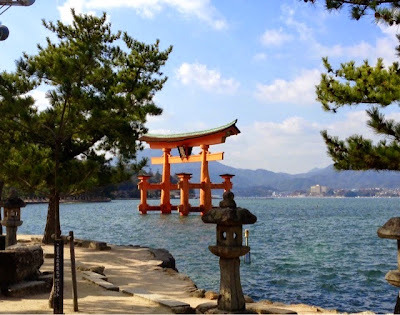 If you have been to Miyajima, what were your thoughts about the island? Did you find it as inspirational as we did? Next time from Sketches in Travel we will look at something that can be found on every street corner that can be a travelers blessing or curse! Find out next week.